For those of us who have long been awaiting an Apple-based television subscription service, well, this may be the closest we get for a while. On Tuesday, Apple quietly added support for Hulu Plus to its Apple TV set-top box, bringing access to ad-supported television episodes and movies for paid subscribers of that service. The addition was first noted by MacRumors. Hulu Plus subscribers get access to the service’s content, while new users have the option of signing up for a free one-week trial or subscribing to the service via their iTunes account, as with Netflix. Once you’ve logged in, you’ll have access to your favorites and your queue, as well as a catalog of TV episodes, movies, and popular clips. 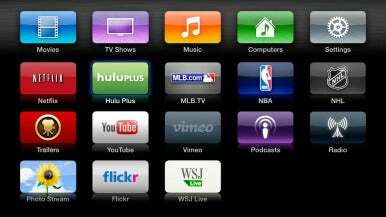 The Apple TV interface for Hulu is very similar to Netflix's and that of the other video services; the top menu provides access to Popular and Recommend items, Recently Watched videos, TV, Movies, Trailers, and Search. Videos are ad-supported, as in other Hulu’s Web and mobile offerings, but you can still skip around, and pause and play as you’d expect. You can resume a video from where you left off, even across platforms, allowing you to start watching a video on your iPad and continue later on your Apple TV. Web Only: We are currently unable to provide this show on your Apple TV due to content streaming restrictions. However, you can watch it from your computer's web browser at Hulu.com. We'll continue to work on clearing the streaming rights for your Apple TV. The service remains beholden to the licensing agreements from the content providers, which prevent a substantial number of shows from being viewed on the Apple TV (or any place other than in a Web browser). In addition, many shows are added to Hulu on a time-delay window that sees episodes arriving as much as 30 days after they’ve aired on television, in an attempt to prevent users from being siphoned away from cable and satellite viewing. On the one hand, I hope that the widening appeal that Hulu might get from being available on the Apple TV might help the case, but on the other, it’s important to remember that the content providers’ customers—the ones they want to please—are advertisers and television providers, not consumers. The addition of Hulu Plus is at least another notch in the belt of the Apple TV. Apple CEO Tim Cook reported during last week’s financial results that the company sold 1.3 million of the set-top box in the most recent quarter, bringing the total for the fiscal year to 4 million units. Though small compared to many of the company’s other products, is not insubstantial. The company has long deemed the set-top box “a hobby,” but Cook has said on a number of occasions that Apple will continue to “pull the string to see where it takes us.” It’s clear that the battle for the living room is only just seeing the first skirmishes. If you the Hulu Plus channel hasn’t yet appeared on your Apple TV, you may need to restart the device by choosing Settings -> General -> Restart. Hulu Plus costs $8 per month.